This was a nice rebound win after the loss in the first game. It’s also nice to see that this club has some offensive talent to it. We had a feeling that the defense might be an issue, so let’s hope the first game was an anomaly, not the norm. While you have to temper your adulation for Meskanen based on where he has played in the past, this guy is definitely making a case to get strong consideration to make the Rangers out of camp. I think that Howden starts in Hartford merely to get him more minutes there than less minutes with the Rangers. Besides, the Rangers have stated that they want to keep Chytil, Andersson, and Howden at center, so if that does not scream “HAYES IS BEING TRADED” then I do not know what does. Unless they put Hayes at wing, I guess. We all watched Hayes on the wing…eck. I think the Rangers should see what kind of training camp he has and how he and the newbie centers perform during the season, before they decide what to do with KH. I think that the Rangers should trade him now before he gets hurt and kills his trade value. ’94, I usually agree with most of what you say, but in this instance I can not. The Rangers are rebuilding, therefore it only makes sense to see what they have in Hayes this year. None of the kids are locks to ever stay in the NHL. If Hayes doesn’t pan out in this, his “show me” year, than you move on, even if that means a reduced trade value. It’s just due diligence when building a team. Joe, I get it, but Hayes is mid 20s, we basically know what he is. Hayes has yet to crack 50 pts, so even 60 pts is a big improvement. Again, with Kevin, the question is, are you paying him $6M+ per after this year? I’m not, no matter what he does this year. He’s not better than Panarin, Seguin, or Stone, for whom I would rather use that $6M per towards. Excellent point! I agree with one caveat. I don’t want to. pay anyone $6 million per year. I also despise NTC and NMC. Unfortunately this will have to be addressed with the next CBA. You can’t keep handcuffing teams with these contracts. either you end them ( I’m for 4 year max and the end of NTC & NMC), or you go to an NFL style contract where only the truly elite get all. of their money an only if they maintain that status. Back to Hayes, I guess we disagree.I just don’t believe we have seen his ceiling, but I believe this is his last year to prove it. If he does, I don’t sign him at $6 mill. Nobody is putting a gun to the team’s head to make stupid deals. No, Reev, you’re right there are no guns to anyone’s head! However, until the issue is dealt with, you have to make some bad deals because you need elite players to win. It’s called market pricing. If some A-hole GM pays too much for someone and you want to sign your player, who is better than the said player, you have to pay more or lose him. That is a sad fact of this NHL. Which is why I propose one of 2 solutions be imposed. So Joe, we agree that either way, good or bad season by Hayes, the Rangers should not sign him for a big contract. As for other FAs, I think the Rangers are gearing up to make a splash, with Panarin, Seguin, or Stone at the top of the list, and maybe Patch as a fall back player. Hayes doesn’t have to be on the wing, he just needs to be able to go below the goal line: his size & reach with the net setting a screen makes him really effective. You just need to be able to cycle on the weak side to be able to get to a good shooting position while the other guy rotates back to the point on D.
For those who thought that Gettinger was slow or didn’t take the body, please note the build up to his goal. Blew a guy up, took the breakaway home. All he did was muck like a sand hog, pressure on the forecheck and cycle the puck. Odds that Meskanen gets the nickname Poncho is 2:3. Can play bottom 6; a line of him, Fast & Andersson would be very dangerous. 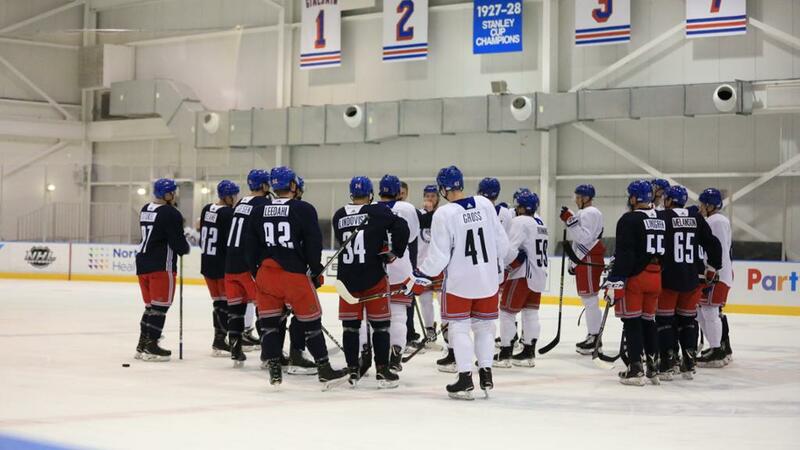 My 3 picks to make the team out of camp: Chytil, Andersson, and Meskanen. And yes, that is exactly the 4th line that I can see, unless you move Meskanen to 3rd line RW and pt Spooner with Fast and Andersson. Meskanen’s game reminds me of Benoit Pouliot’s style of play, kind of reckless for a skilled and fast skater. I hope to see him in the top 6 if Vladdy doesn’t make it up there. The very least put him with Hayes or Zib during the pre season games. He’s a shooter and should be next to a playmaker. He should also be in competition for that PP2 slot. His two way game looks good so far, maybe a proven 5v5 center might elvate him to be a 20 goal scorer. Competition like that are why I don’t think Vesey will last very long in a Rangers uniform unless they pull the plug on Fast. I agree Reenavipul, that was a nice sequence by Gettinger. With the club not exactly stocked with big wingers like that kid it would be pretty cool if he shows he belongs with the big club sooner rather than later. JG did say however that he is hoping to get a deal done with Hayes. Also, I think that the approach of keeping the trio of youngsters at center short term is just smart thinking. But … it is more than likely that either one of them will seem to be more suited to the wing OR one of them will peak at a Nieves level or lower. It is not a done deal that the Rangers have five top quality centers going forward. Also, ideally, you want four good centers and a fifth guy who plays wing but can be a quality center in case of injury. Howden looked good to me BTW. Yep Raymond, I saw those comments too. But I would bet a lot of money that the “hold up” will be the lack of a NT or NM clause in the contract, that causes Hayes NOT to be re-signed. That will be Gorton’s “out” for not extending Hayes. I agree that JG is not going to be very amenable to handing out NMCs and NTCs. And if that is what Hayes demands, then he will likely be gone. Sorry buddy but your reading the situation all wrong if you still believe that. The whole gutting of the roster. Hayes camp wanting to wait. Giving him the prove it deal while coming out to the public of wanting him to stay as a NYR. That loses leverage considering they didn’t want to trade him while teams were asking for him. If that doesn’t scream that he can earn himself a 6+ million dollar contract with 6 years than I don’t know. If that doesn’t translate to what Brooks was saying earlier about how it might be Hayes vs Zib than I don’t know what does. Hayes isn’t moving to wing. He’s for sure a 200 ft center who can put up points during 5v5 while shutting down top lines. Expect him in the top 6 my friend. Quinn wouldn’t do him like that anyways so that’s a long shot. I don’t disagree bro, but to START the season this way. No way does Hayes keep Howden from being here, eventually. I’ve been team Howden ever since they traded for him. He’s keeping Andersson down, that’s been my prediction since day 1. If it came down to a top 6 center vet being moved than it will most definitely be between Hayes and Zib. They wouldn’t just call it a day and move Hayes. That’s what I have alluded to ever since Zib didn’t make the untouchable list. I know Peter or other’s won’t drop by and give you the 411 speech that I tend to only receive when I want to back up a certain individual. I’ll give it to you though and that’s that Howden could play 4c because teams nowadays are deep with depth. I still doubt that he’s any threat to a rookie Hayes who learned how to be a NHL centerman on the fly so no comparison to a veteran Hayes. Btw there’s no disagreement to what I was saying, I was feeding off of JG’s quotes. Ha, if saying that I don’t think we’ve seen enough of a player to make a judgment yet is too tough to take, then I don’t know what to tell you dude. ^ That’s exactly my point, you only seem to tell me on this blog about the obvious. I never catch you telling the other people about how we’ve haven’t seen enough of Andersson, Chytil and Howden to make a solid case of replacing Hayes. 2) I’ve never said a thing about Andersson replacing Hayes. I am not among those that want to see him go. I have been pretty consistent in saying that we don’t yet know what we have in the three young centers. I think you misunderstand my posts. Chytil and Andersson are locks to make the team out of camp. And Andersson won’t be the one keeping Howden out of the NHL, I can assure you that much. Meskanen was the leading goal scorer on a 1 line bad team where nobody could score. Would rather have him than Virta here every day. Meskanen will get a long look for sure. Would not surprise me if he makes the team. I don’t think it has sense to trade Hayes, 1st of all Andersson not proven to be top 6 material, second of all Chytil is not proven to be reliable center… and it will take years for him to establish himself as a center…. Howden also not proven to be top 6…..
Namer and Spooner are not centers as they relate to the Rangers. They are both playing wing, for sure. Chytil and Andersson are going to be starting centers for the Rangers, that’s what this season is about. The centers are: Zib, Hayes, Chytil, Andersson, and Howden, one too many. Gorton made it very clear that the young players would play at their natural positions, which is center for the latter 3 centers listed. Someone is going because Howden will be up sometime this year, presumably after Hayes is traded, assuming that Kevin is the one to go. JG has been on the record saying that he’s not moving guys for the sake of making room. First they will have to earn it through training camp and first the month of the season which probably meant outplay a center vet. Than JG said that he would make the necessary moves if they can show that they’re ready. I’m taking that as a sign from what Brooks said. They will pick between Hayes and Zib and Quinn will get a say who stays and who goes. You thinking that they would move a center for the sake of handing a roster spot to a rookie is why your trade Hayes fantasy never came true. We both know personally Hayes will be moved some point in time this season. It appears his agent played hardball with Gorton and something got strained and now Hayes will be turned into a high draft pick and NHL ready prospect. I like Hayes, I feel he is a really good player, plays a 200 ft. game, has a long stick to defend in the D-zone and now is scoring over 20 goals. You trade from your strengths and being the Rangers in one year have a some solid depth at center. Lindgren is the first player to come up from the blue line or maybe the first prospect up if Hayes is not moved. Howden progress in Hartford might determine the time table when Hayes is moved. You’ve both called down the thunder. Beware of the wrath that the defender of the greatest center in Rangers history will bring upon you and family name. You’re not taking any chance… It’s been said and way past people’s due dates that Hayes would be traded. You have both the coach and GM saying otherwise. From what I heard about Game 1 and what I saw last night, Lindgren is nowhere close to NHL level. On the current depth chart, I would guess he is 14th of the sixteen defensemen, ahead of only Crawley and Pedrie – and I am not even certain about Crawley. That is not to say that he does not have a brighter future than guys like Gilmour, O’Gara, Bigras, but he isn’t there yet. He will not be the first call up. Lindgren’s D is fine, just sorta meh at a tourney where he’s should be jumping off the page. Day’s D was at the same level or better, but his ability to jump in and get back to the point quickly to generate more O was way better. Hey bro, Hayes is a perfect fit for the Yutes, but what would they give the Rangers? I think its pretty much guaranteed that Hayes will be moved. The only thing that gives me a pause is the health of Zibenijad. I’m worried about them trading Hayes and Zibenijad becoming an oft injured player. I don’t want a 1st line center who is an injury risk every season. That’s exactly why Steve Valiquette is on the MSG panel saying that Hayes is here for the long term and that the Rangers don’t have a 1c. Hayes is playing for a extension and Zib just like Stepan 2 years ago is playing to stay pass his clause once it kicks in. I think that is probably why Brooks got a inside source of JG picking Zib vs Hayes when the time is right. They thought he could sign this summer but his 25 goal scoring made it difficult. So now he will get a NTC clause that could start immediately after he resigns with the Rangers for more money if he can be “that guy”. I don’t find any coincidence of Quinn staying in touch with Hayes all last season when he has never even had him as a coach. You don’t have to like it but his recent interview screams team Hayes. That would be a bad trade for the Rangers. The Breadman can’t carry a team for one. He’s good but not a Superstar but he asking for big dollars. Hayes and Vald will total more than 55 goals and 80 assists. Plus you want to throw in a #1 pick ridiculous. We don’t know what we have and you want to add salary. This is why only one CUP in 75 plus years. It wouldn’t be a good trade (sign him in the off season), but Panarin is a star and a great sniper. Easily would be the best offensive player on the Rangers. He has 233 points in 243 games. Those are great numbers. Don’t @ me, it’s just a guess. I tried warning folks on here about Stepan being dealt a similar package that he was traded for. I got the same replies as this one lol, so we’ll see about that. CBJ fans would cry about that trade the next 4+ years. If he went to Ottawa than he’s putting up his same points, 20-22 goals and 40-48 points. Panarin is a more consistent just a better overall player. He could still give the PP a better and more consistent punch to be a top 5 unit. His 5v5 play alone would make the trade a steal for the Rangers. You have to be real about this, you can’t compare Zib to a 50+ player and a 20+ goal scorer, he would lose the argument every time for you. Sorry but Zib’s mid to late 20s is pretty foggy. Panarin’s late 20s to early 30s seems 100% more visible. I have a lot of respect for Valley, I really do, but with all these top FAs available, why give a big chunk of cap space to Hayes? Hayes, Namer, and a D prospect for Panarin. Because Staal will be gone soon and most likely 2 names from the Vesey, Spooner and Vlad pile. Smith’s contract is up soon and along with decisions about Kreider and Fast after this season. Hank’s fat contract also will be coming up (even if he signs). He could dominate the league all season again on the PK and now on the PP. More minutes in 5v5, OT and chances on the shoot-out is why he might take a chunk out of the Rangers cap. He already ranks 4th in the league on scoring first in a game which should be a tease after you bump up his playing time. JG, Quinn and Hayes have talked in coded language about how the money being there and how he will have to earn it. My gut tells me if he goes off as a 60-65 point all situational center than he’ll take a pay cut and sign in between 6.2-6.5. million dollars. From the source that I heard and know from, they’re all close due to family and geographics. Hayes will probably take that cut for a NMC until he hits 30 or 31 yrs old and make JG look like he made a bargain deal. Why are you trading for a guy you can get for free in 10 months? So you can get enough points to draft 7-10 will giving up assets they already have? Goddamn, people; look at the roster and get on your evaluation skills. Nothing is guaranteed in this world. IF Chytil AND Andersson step up while Hayes is good. IF Howden is so good in HFD he kicks the door in. The GM has to try and put the best roster out there until the owner tells him not to. As an aside, Slats is in town after missing last year. t seems to me that the Rangers would rather keep Hayes than deal him unless he demands a NMC or NTC. The young man is a talented center. I don’t think he is a #1 on a good team, but certainly a #2 on most good teams. I think the Rangers gave Zibanejad that contract intending to keep him. It is not an expensive one and it does make him a tradable commodity if they wish to down the road. Eventually they might have a center log jam if the youngsters like Chytil, Howden and Andersson push due to strong play, but that really remains to be seen. I believe that because of Chytl’s tender age that he is liable to begin the year on the wing if he makes the club out of camp. I think Howden probably starts in Hartford to get in some AHL time, but perhaps he gets called up. Andersson probably makes the club out of camp unless he shows otherwise, and plays at least the 4th line center unless he shows he is not up it to yet. Andersson is 19 and turns 20 in October so he is still young, Chytil just turned 19 last week, and and Howden is 20 turning 21 in March. They got some time to look at these kids and see what they have. Gettinger’s stock keep rising in my eyes. They could use another big kid like him on the wing. Gettinger can play both pivot and wing. A much better skating version of Mike Rupp. His height/weight combo is 198cm/101kg, which is above the threshold for an average NHL player. The way he has been played in the tourney, he is getting evaluated for center & wing as a 4th liner ceiling for the Rangers this season. The skating/size combo could get him paired with Hayes at some point if management wanted to push boundaries. That’s a tremendous mismatch. So you think Gettinger will see time on the PP, PK, top 6 against good lines? I doubt it and personally I rather not see that experiment unless if it’s a pre season game, I don’t see him keeping up 16 mintues per game with Hayes. I could see them tossing a shooter with speed and a better 2 way forward like Ville Meskanen to flank on Hayes line. If it’s going to be someone who has a heavy game in the top 6 than they better play like Matt Tkachuk. Gettinger didn’t even play center? I doubt they add more jam to that cluster when they already have Nieves and Letteri to add as possible 3c/4c. Gettinger is feisty for sure but every hit attempt made him look like a giant pinball. When has Hayes seen PP time? He’s a matchup center where he’s neutralizing top 6 F, and Gettinger is a better skater than Hayes. Buy new glasses or get an AppleTV to actually watch games. I never pointed to Hayes seeing PP time? I am telling you that he will see a major PP role. You obviously don’t follow the news but there’s no way he would bet on himself without that being brought up in their 2 hour meeting. He saw 2 months worth of PP time which resulted in him scoring 25. Don’t play yourself if you believe that he won’t finally get a full season on the PP . Gettinger is a poor skater compared to Hayes. Senses, IQ and hands is why Hayes skates freely with the puck in any zone for a big man. I doubt Gettinger will ever be like that because he lacks those three things. It’s cute how you think he’s on par after a couple game in a tournament with teenagers. Stop playing yourself, you want to try so hard to come up with these labels. Lars, Couturier, Bozak, Eakin were matchup 3s with PP time. Some have maybe graduated while other’s drop down as the 3c but they always played against top lines on the PP with worst numbers. Try following the Rangers and computing what JG and Quinn said about Hayes. They want him to be the man and soon you will get updated on what that means in the NHL. Folks no one is mentioning Hajek who looked to me to be far and away the best blueliner for us in the first 2 games. I was impressed. Howden is doing well up front. Didn’t watch any games, but the reality of the situation is that we have some good problems at center. Probably have 7 centers on a team that needs 4. We have to see if this is a youth movement where the kids overhaul the roster, or if we allow the best 4 in camp to make the team. I cannot see anyone overtaking Zibby and Hayes out of camp. That leaves 2 spots. Names and Spooner make the team as well, as wings but with center experience. Chytil and Andersson seem to have the edge at the final two spots, unless someone feels one can be a young-elite-to-be winger. This puts Howden and Nieves on the outside looking in. Wild card here is if another team comes looking for a player due to injury. I think Spoons, Names and Hayes will be the players offered up. We shall see what these players bring to camp. If you want to see slow skating, keep your eye on Joe Veleno, #90 for the Wings.